And that was my introduction to Sally Thomson. Where many of the photos I saw that afternoon were pretty, intriguing, and impressively technically correct. Sally’s work was breathtaking and awe inspiring. I feel so fortunate to have been able to have had the below conversation with her. She offers so many golden bits of advice and connects her passion for photography with her lifelong commitment to environmental protection. Bryn: Do you want to tell me how you first got into photography, so we can know a bit of your story? Sally: Growing up I used to pour over the big picture magazines, like Life, Look, and National Geographic. I think that really helped shape my early interest in photography. My first camera was gifted to me when I was in college, and it was a used Canon FT 35 mm film camera. I used it primarily when I was in graduate school to document my work as a landscape architect in my schooling, and later on when I graduated, and I was working. So, it was in about the late ‘90s, I switched jobs and started working for an environmental non-profit organization that worked in the Peruvian Amazon. This opportunity introduced me to this whole range of really amazing people, scientists, conservationists, and photographers, because it was affiliated with National Geographic’s Missions Program. So, part of my job there was to bring about awareness of rain forest conservation, and we did this through a variety of educational initiatives, and so on. I realized how important photography was in communicating what it was we were trying to do. I think that was really a turning point for me, because I could see there was a way that I could utilize my interest in conservation work and in human awareness, and then photography all at the same time. After many years of visiting New Mexico, my family moved there. And that’s sort of when I was able to dedicate myself to photography. I started taking workshops and courses, and that’s been going on since then. Bryn: That’s so interesting that you didn’t study photography per se, you studied landscape architecture, but then you saw the connection and how powerful photography can be. And did the job that you got that had you traveling to Peru, was that something that they needed a photographer for? Or did you find on your own how powerful photography could be in communicating what was going on? Sally: This was just prior to the digital revolution, and so we had to do a lot without the use of computers, also it was before people realized that NGOs really needed a lot of help to get the word out there. I could see that, but I wasn’t trained as a photographer. I knew a lot about design, and I knew the same principles applied to design work, you know, line, fixture, form, color, shape, all those kinds of things that also applied to photography. But I didn’t know the mechanics of photography as well as I needed to. Bryn: From what you’re saying though, it sounds like you have been in photography for a long time. Because, I remember that when we were first chatting in Oaxaca, I don’t remember what I said, but you said something like, “Oh, but I’ve been doing this for a long time.” So, I wonder what has inspired you to stick with photography all these years? Sally: Well, I think, it’s become a part of life for me. It’s something that I don’t really think about not being a part of. When you’re working, and you’re working for somebody, often times you get discouraged, and you think about quitting or doing something else. I think it’s important to have personal projects that you’re working on, because those are projects that mean something to you. There’s a reason why you got into it to begin with, and if you can keep that going, then, when it gets frustrating, or even when the times are lean, and you’re not having any work, you have that to go to. I think that’s what really kept me going, because I’m still doing things that I find very interesting, and it motivates me to want to keep doing it. Bryn: That’s such an excellent point. I think we are in a time when people are working so much, and people have to remind themselves to find more hobbies, or to find something that makes them happy. You are saying that you are able to stick with something so long, because you have those important side projects. And because you realize that it’s important to have this balance with continuously developing your creativity. Sally: Right. Sometimes when working with a client, you have constraints that may not be what you personally envision. But yet, you’re working, and you have to do it that way. So, what I’m saying is that if you have your own work, and you’re shooting at the rate that you want to, and you feel like you’re growing in some direction, I think that can help you maintain and keep going. Because, there are always times when you get frustrated and you think, “I don’t want to do this,” but you have something else that you are doing, and that keeps you going. Bryn: I think that’s a really good point. What you are saying is how important it is to practice photography because you like it, and not always because you get a paycheck. What would you say your favorite theme to photograph is? You’ve connected your professional life with landscape architecture and projects working in environmental protection. But, what would you say you primarily work on? Sally: When I decided to dedicate myself to photography, I had already been photographing plants, gardens, and landscapes. But, on a trip to Guatemala I started photographing people, something I had never really done before. I was so excited about that experience, because it opened a new way of seeing the world for me. I loved meeting people, listening to their stories, and looking more intimately at the relationship between people, place, and culture. When I think about my photography, I really see it as a form of storytelling that focuses on photographing people in their environments. I think that is really what I enjoy doing the most. Bryn: And when you are talking about photographing people, and getting to know them in a more intimate way, are you doing more of a portrait style of photography, or are you doing more incidental photography where you are photographing what is naturally happening? Sally: I like to shoot what is naturally happening. I like to photograph people doing what they are comfortable doing, and that often evolves into a portrait scene. And that’s how I approach it, because if I just say “I want to take your picture,” people can get very stiff. I like for people to feel comfortable. So, I take a variety of images of them, usually when they are involved in doing something. I photograph that, but then I also want to get a portrait of them too. So, I do both. Bryn: I can imagine that you will build their trust by photographing them in what they normally do for whatever cause they are working for, or whatever event they are working on, so that when you do take a portrait of them, it’s more natural. Sally: Yes, that’s what I’m hoping for but it doesn’t always work out that way. I think that you have to build a trust, and that can take time. Bryn: Yeah, I have kind of been thinking about the same thing, and I see what you’re saying. Earlier when we were catching up, you were telling me about your trip to Romania. Do you want to tell me why you went there and why you found it so interesting? Sally: I’ve been photographing farmers and ranchers here in New Mexico, as well as people connected to the land in other places around the world. I’m particularly interested in traditional cultures that sustain biodiversity, livelihoods, and traditions. I decided that I wanted to go to Romania, because it was one of the last places in Europe where medieval agriculture is still practiced. People use hand tools to cut hay, and a horse and cart to harvest their produce. With nearly 5 million family farmers, most people in the countryside rely on subsistence, sustainable farming to survive. So I wanted to see that, and document that. Through researching I found a fixer, who is someone who could translate and take me around to all the places that I wanted to see. It was interesting to witness a way of life that has endured for so long. Things are changing quickly, though, because of Romania’s entrance into the EU. While not an easy life, these farmers have developed ingenious practices over the centuries that provide food security and maintain a healthy ecosystem. I think that there are things that we can learn from them and apply to more modern technologies, so we don’t lose the skills and knowledge that they have about the land. We can use that information in ways that we currently approach land management. Bryn: That’s a really good point to take away. And I imagine that you thought about what you appreciate about your life that you can learn from other cultures and what you can appreciate they have that we don’t have in our culture. Sally: Absolutely! The places where I photograph are often very different from where and how I live, and I like that! I have learned a lot about resilience, determination, and patience from the people that live close to the land. Bryn: Do you want to talk about your ranchers project, because I think that’s really interesting. And I can see how it relates to what you did in Romania. Sally: Stories from the Range is a project that began in 2011 shortly after I moved to New Mexico, and has taken me on the land, and into homes of ranches spread across the Rocky Mountains and the American Southwest. It evolved out of sheer curiosity, and a desire to better understand a culture and landscape surrounding me. As I mentioned earlier, I’m interested in the relationship between environments and human culture. I wanted to see first hand how an essentially fragile desert landscape and an American iconic culture were fairing in the 21st century. I contacted several local environmental organizations that specifically promote sustainable ranching in the Southwest. Luckily, for me, one of the organization’s happened to be looking for a photographer to promote their mission. So, they hired me to photograph a variety of ranches throughout the region. Through that work, I was able to build my own body of work about family ranching in the Southwest, and that’s actually the project that was selected by The FENCE NEW MEXICO this year. The FENCE is a national outdoor photography exhibition series launched five years ago by United Photo Industries in Brooklyn, New York. The exhibition is currently shown in seven cities across the US. I was one of the nine photographers from New Mexico to be selected for the FENCE shown in Santa Fe. My project, Stories from the Range, is about family, stewardship, and sustaining traditions in small ranching communities across the Southwest. It’s a vanishing way of life that most people no longer experience, since nearly 80 percent of the population now reside in urban areas. Bryn: Okay, so they were part of a cooperative and they hired you to communicate to everyone else what they were doing and the good that they were doing. And you said that that work was what you entered to be part of the Fence Project. So could you explain that, what the Fence Project is? Sally: Yeah, the FENCE is a national outdoor photography exhibition series that features photographic narratives about our communities in a global sense. Photographers submit 3-5 images that represent a body of work that fits within seven categories: people, play, nature, food, creatures, food and streets. It is open to all levels of photographers, and is juried by a diverse group of industry professionals located nationwide. I think they select 40 photographers every year for the national exhibition. According to their website, the idea is to bring photography to the public, and make it much more accessible, because many people won’t go inside a gallery to see artwork. It’s been so popular that they’ve expanded it to 6 other cities in the United States: Houston, Dallas, Boston, the Raleigh-Durham area, Santa Fe, and Denver. It’s the same show, although it rotates at different times of the year. Bryn: It sounds like a really interesting project that they do. So, they’ll have the same national photos in all the cities that they go to, but then they have regional photos that more talk to the area that the city is in, and that’s what your images are in? I think that’s a really good point. The Fence Project being outside, it will drive attention to the art to people who normally don’t go into art galleries. Sally: I think that’s the primary purpose of it, really. It’s a way for artists to get their work out there number one, and it’s a way for more people to see the work. The stories also foster a dialogue about how we live, what is important, and what is happening both around the world and in our communities. It’s about telling a human story with images in a compelling way. Bryn: Interesting, I’ll have to look into that. Like we’ve kind of been talking about already, what advice would you give younger photographers? And what have you learned along the way? What would you recommend to someone who’s just starting out in photography that they should do? Sally: One of my professors used to tell me this all the time in design, he would say “trust your instincts.” At first I never understood what he was talking about. But, it is your instincts that are the essence of you, and that is what will show up in the creative process if you allow it to. It will be your point of view, you already have that in you - learn to trust that, and base your decisions from there. Photography is something, to me, that you build on. It’s a lifelong thing, it evolves and changes as you do... be patient and flexible. Keep reading and looking at the work of other creatives as much as you can. I think a liberal arts background is helpful, because it exposes you to la lot of different subjects, and helps you determine what is it that you want to do in life. And, as a photographer, it’s important to have other interests, because that’s what’s going to drive your photography. If you are a hiker, if you like cars, or whatever it is you like, that passion is going to show up in your photography, because that’s what you’ll want to photograph. Once you get to that point, read, and find out everything that you can about that. Just always be looking, and adding things that will add to your toolbox of techniques and resources. Bryn: And when you talk about enhancing your visual literacy, do you think that by looking at images with a critical eye to the composition, how the light is coming in, what do you mean by that? Sally: Well, finding out who the good photographers are historically, looking at their work, trying to understand what it is they were doing, and why they were doing it. I would suggest people do that in all types of photography to see the differences, but then I think it’s great to take workshops and online tutorials. There’s really a lot out there to educate yourself just online. Bryn: Is there any resource online that you think is really good that is affordable, especially for someone who is interested in your type of photography? Sally: There’s a couple sites, like Creative Live, Lynda.com is another tutorial site. There’s one called The Compelling Image. To see what other photographers are doing, I like to look at sites like the NY Times Lens Blog, LensCulture, Lenswork, but I’ve taken a lot of workshops too, including the one with Maggie Steber by PhotoXpeditions. At the Santa Fe Workshops, they have videos of many of their instructors on their website. And those are great for inspiration. Look under the instructor’s tab to see videos of the pros talk about their point of view, their life, or technique. So, that’s a little unknown resource. Bryn: Well, this has been such an enjoyable conversation. And I’m glad we were able to catch up. I really enjoyed hearing about all of your experiences in photography, and your insight. I think it’s really interesting how you first got started with it, and that you saw the power of photography, and decided to keep with it. Sally: It was one of those things, I thought, where in the world is this leading me, you know? There are times when you don’t see the thread that is directing you in life. I guess if you are passionate about something, it never really leaves you! Thanks so much Bryn, thanks for thinking of me, and giving me this opportunity to talk about my photography! I appreciate that very much. Bryn: Yeah, I’ve really enjoyed the conversation! 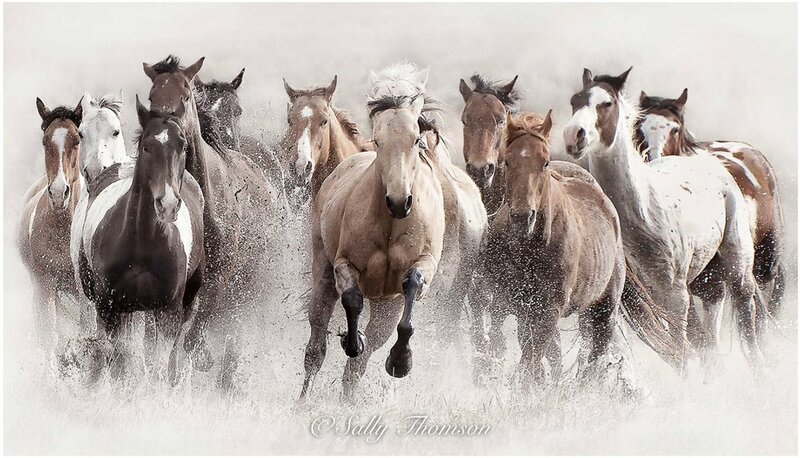 To learn more about Sally Thomson, and to see her work, visit https://sallythomsonphotography.com. Also check out Sally’s work on in THE FENCE project, and her Stories on The Range project.